LOCATION.--Lat 40 07'26", long 75 13'13", Montgomery County, Hydrologic unit 02040203, on left bank of downstream side of bridge on State Highway 73, 0.5 mi downstream from Sandy Run, and 1 mi south of Fort Washington. PERIOD OF RECORD.--June 2000 to current year. September 1961 to March 1969; Annual maximum October 1969 to September 1979, at site and datum then in use. GAGE.--Water-stage recorder and water-quality monitor. Datum of gage is 139.98 ft above National Geodetic Vertical Datum of 1929. From September 1961 to March 1969, gage at present site, at datum 140.70 ft above National Geodetic Vertical Datum of 1929. Satellite telemetry at station. 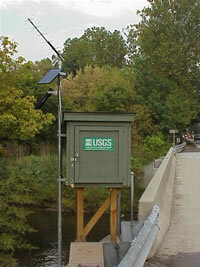 Supplied by USGS: Data transmitter operational limit - 17.9 ft, at 12.9 ft, road overflow begins.